A&E departments in England deal with more than 21 million patient attendances every year. Ever increasing patient numbers have put A&E departments under strain in the delivery of services. This can negatively affect the experiences of both patients and staff. Patients, who are already feeling vulnerable, can become frustrated and hostilities can easily arise. A&E staff, many of whom are working 12-hour shifts in this pressured environment, often bear the brunt of these tensions. Perhaps unsurprisingly, staff wellbeing in A&E departments can be particularly low. However, for patients encountering a complex system, human contact is the best way to provide guidance, help and reassurance. Improving staff morale and engagement therefore has a multitude of benefits - both for patients and for the system at large. Increased staff satisfaction will reduce turnover, absenteeism and their associated costs, and leave staff more able to deliver the core values of the NHS Constitution: compassion, dignity and respect. Recognising this, the Department of Health partnered with the Design Council to explore how design could be used to alleviate tensions in A&E departments in through the Reducing violence and aggression in A&E: Through a better experience programme. Drawing on insights and methods from psychology, economics and neuroscience, behavioural science challenges the view that people always behave in a rational self-interest, arguing that people often make decisions with little conscious awareness. This has major implications for how governments can achieve their objectives beyond incentives, legislation and information. In the context of A&E, there is a natural assumption that people who behave aggressively towards staff have made an active decision to do so. We assume they are unwilling or incapable of changing, which leads to standard approaches of more security or threats of punishment. However, if we know that people’s intentions do not always translate into action, and that emotion plays an unconscious role in decision-making, we need to provide practical help for people to overcome these barriers or go with the grain of making better decisions. This means designing solutions that are grounded in what people really want and need. Much has happened recently in UK central government to introduce new methods to policy teams, including those offered by design. 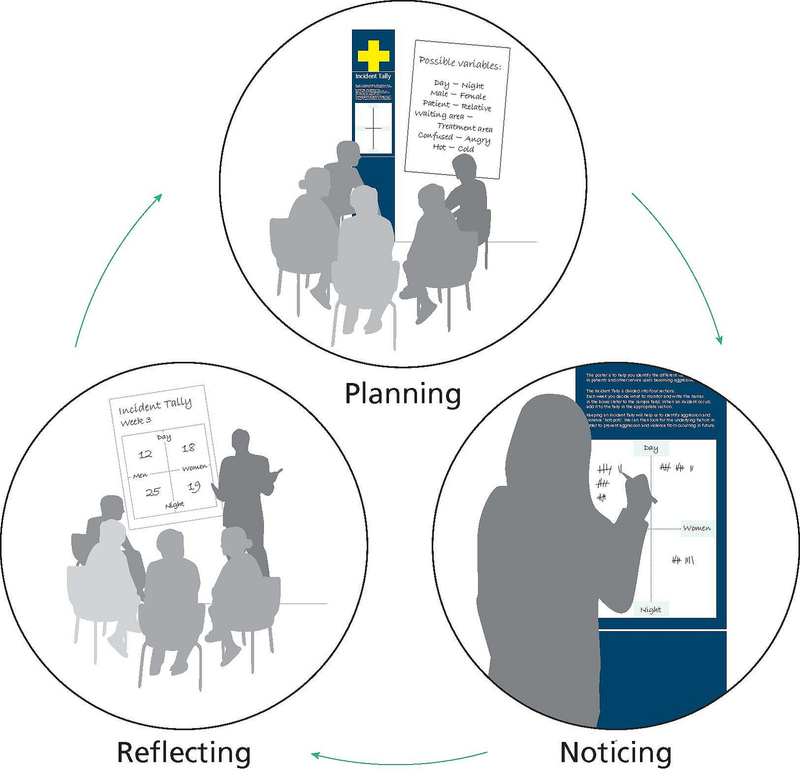 The Reducing violence and aggression in A&E: Through a better experience programme offers a practical example of how design and behavioural science can help governments become more open, ambitious and collaborative in how they make and test policies. The group partnered with three NHS Trusts considered broadly representative of A&E departments across the country (Chesterfield Royal Hospital NHS Foundation Trust, Guy’s and St Thomas’ NHS Foundation Trust and University Hospital Southampton NHS Foundation Trust) to research, develop and test solutions in operational A&E departments. The Design Council first examined existing reports on recent aggressive incidents in UK A&E departments, and reviewed previous attempts to control and reduce this type of behaviour in other public-facing services. This research was supplemented by ethnographic research, with more than 300 hours spent conducting observations and interviews in A&E departments. This identified six ‘perpetrator characteristics’ of individuals who commit acts of aggression or violence, and nine sets of ‘triggers’ of violence and aggression. These included the waiting experience, the effect of the environment on people’s behaviour, and how the intense emotions that play out in A&E create a ‘melting pot’ of anxiety. This research informed design briefs for multidisciplinary teams to design new systems, services, products, communications, buildings or experiences. A team, led by design studio PearsonLloyd, worked with specialists in organisational dynamics and clinicians to create ideas for new communication systems, staff support services and secure spaces. The design team sought to identify major areas and triggers of anxiety and aggression, and create solutions that would bring the process closer to an ‘ideal’ patient experience. For patients this meant being better informed at every stage of their journey through A&E and remaining in control of decisions. The design team created computer models, mock-ups and initial prototypes to test their ideas in real A&E departments and get feedback from staff and patients. Feedback on these prototypes helped develop the designs and establish criteria for evaluating the success of programme’s interventions. The final recommendations provide physical changes within the A&E department as well as creating behaviour change among patients and staff. 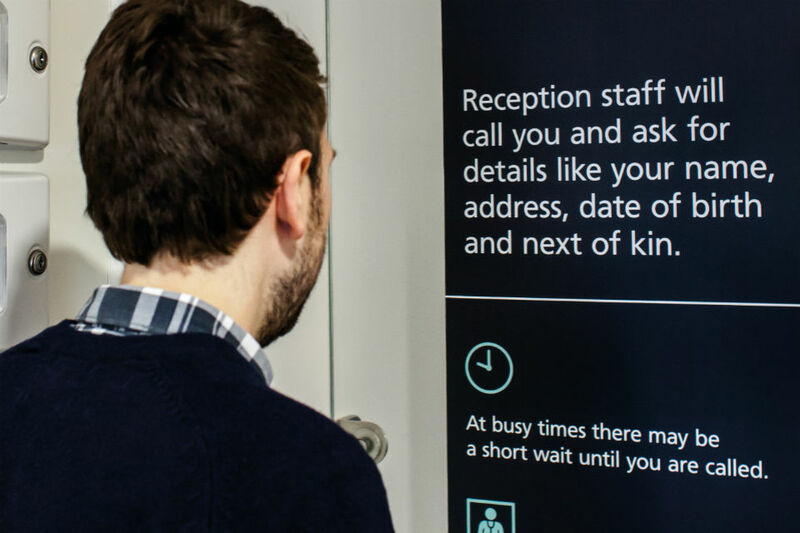 The Guidance solution aims to reduce anxiety levels by using signage, leaflets and digital platforms to provide information about the department, waiting times and treatment processes. The People solution supports frontline staff in their interactions with frustrated, aggressive and sometimes violent patients. Staff are given opportunities to discuss issues and concerns, with the aim of boosting morale and reducing staff absence, and an induction booklet introduces new staff to the working culture and dynamics of the department. The Guidance solution aims to reduce anxiety levels by giving patients more information. The Guidance and People solutions were installed and piloted at two A&E departments: Southampton General Hospital (University Hospital Southampton NHS Foundation Trust) and St George’s Hospital (St George’s Healthcare NHS Trust). Comparator control sites, with similar characteristics were also selected for the respective pilot hospitals. 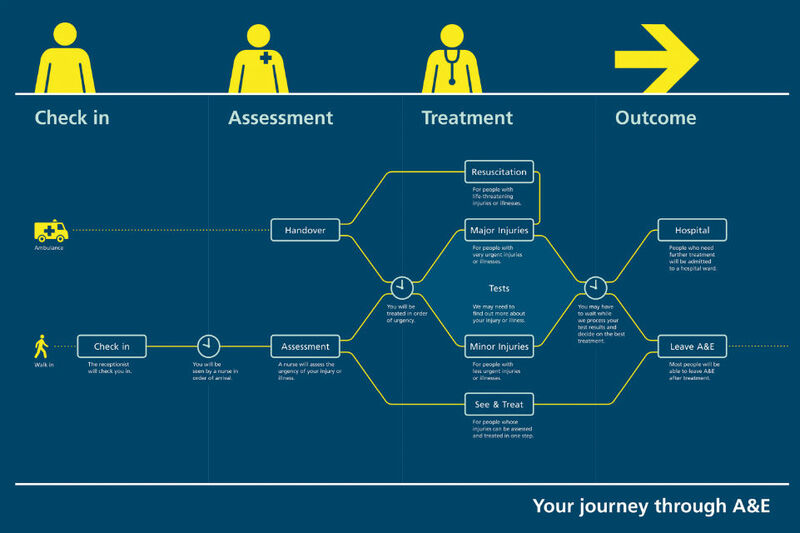 Evaluators, Frontier Economics and ESRO, robustly tested the impact of the design solutions by collecting primary patient and staff data through immersive methods; collecting secondary A&E data; and undertaking cost-benefit analysis. Pre- and post-implementation data from the pilot hospitals were contrasted with one another, and to comparable A&E departments where the design solutions were not implemented. Clarifying the A&E process and improving the physical environment has improved patients’ experiences, and reduced the potential for escalation into hostility.. 75% of patients said the improved signage reduced their frustration during waiting times, and complaints about information and communication fell dramatically. Both patients and staff observed significant reductions in acts of non-physical aggressive behaviour. Threatening body language and aggressive behaviour fell by 50% post-implementation. Associated improvements in staff morale, retention and wellbeing have also been reported. Installing the design solutions represents considerable value for money. The benefits of the solutions outweighed the costs of implementation by a ratio of 3:1, meaning that for every £1 spent on the design solutions, £3 was generated in benefits, with the greatest cost savings coming from reductions in aggressive behaviour. This is a conservative estimate of the potential benefits which could be realised from implementing the design solutions in A&E settings. Other potential benefits, such as reductions in stress-related absences, increased staff turnover and changes in litigation costs, were not included in the value for money assessment as they could not be reliably measured within the short time that has elapsed since implementation. A Better A&E’s Guidance solution signage has been independently purchased and installed by a further three Trusts beyond the initial pilot sites. PearsonLloyd works with each Trust to customise the solutions to the requirements of each department, reflecting the different processes and cultures that exist, and are also offering a template package to allow Trusts to install the Guidance signage at a lower cost. Five Trusts are currently trialling the template package and the first template installations will be completed early in 2015. A further 20 Trusts from across the UK and as far afield as Australia are interested in installing the solutions. The evaluation findings from Reducing violence and aggression in A&E: Through a better experience further strengthen the evidence that cost-effective design solutions, informed by a deep understanding of human behaviour, can play an important role in improving patient experience. NHS England is exploring options to increase the uptake of these solutions. It is also hoped that learnings from this programme can be applied beyond healthcare, with the potential to demonstrate benefits in other public settings. Excellent examples of design in action. Well shared. Thanks. When I was at University in Cornwall in 1995 the year above me on the BA Hons Graphic Information Design course I was on, pitched and secured a live project against established signage companies, for Truro hospital that redesigned all their signage. Although not quite as in-depth as the behaviour change outlined above it's amazing to think that it's taken 20 years for folk to become wise to the idea that design can 'improve policy' and effect change in people. The behavioural pschology applied here could be extrabolated across the whole of public services. The tax system often causes unintended aggression by taxpayers in two ways - firstly they feels anxious by not understanding the system, which is very complex, and secondly HMRC constantly adopts the moral high ground and is often preachy and aggressive about collecting the very high amounts of tax imposed on the population. This makes people resent the department instead of want to cooperate with it. If tax were simpler and lower there would be less push back against it and tax would be collected more easily.